Saturday, 4 June 2011, Day 193/365. “There’ll be about eight kids sleeping over including yours and mine,” these words striking dread into my heart. “But you can go out, or go home if you want,” was a leave pass that I could have taken up. The occasion, The Surfer’s son’s 12th birthday. 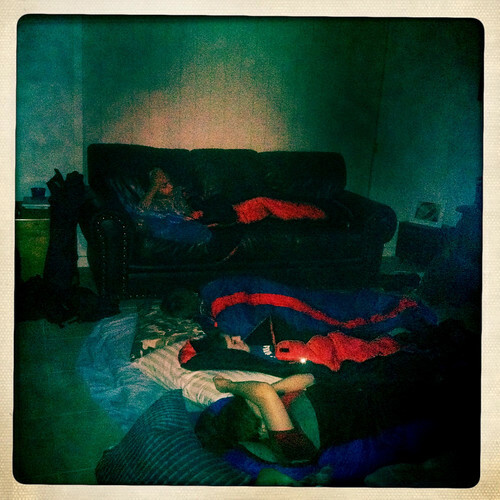 All the boys – six of them – slept in the lounge, and the girls – three of them – slept in his girl’s room. This was after they’d been there since midday and they left around midday the next day. One whole day of lots of kids. Overall it wasn’t too bad. They were pretty well behaved and we just fed them and provided supervision and told them to be quiet and go to sleep just twice. I didn’t end up going out because I was coming down with a cold and didn’t feel very well at all. I probably should have been home in my own peaceful house but I wasn’t. We all survived, there was only one black eye from some backyard shenanigans, and the birthday boy had a fabulous time which is the main thing.